Aggregatibacter actinomycetemcomitans and Porphyromonas gingivalis have been frequently isolated in periodontitis patients in Morocco. Its persistence after the subgingival debridement of the biofilm has been correlated with worse clinical outcomes. The aim of this study was to evaluate the antimicrobial susceptibilities of A. actinomycetemcomitans and P. gingivalis, to amoxicillin, amoxicillin plus clavulanate, metronidazole, and azithromycin. In addition, microbiological profiles of patients harbouring A. actinomycetemcomitans, P. gingivalis, or both were compared. In 45 consecutive periodontitis Moroccan patients, subgingival samples were taken and processed by culture. Twenty-four A. actinomycetemcomitans and 30 P. gingivalis colonies were isolated (54 strains) and susceptibility tests, using the epsilometric method, were run for amoxicillin, amoxicillin plus clavulanate, metronidazole, and azithromycin. Minimum inhibitory concentrations for 50 (MIC50) and 90% (MIC90) of the organisms were calculated. The prevalence of A. actinomycetemcomitans and P. gingivalis was 79.5 and 84.4%, respectively. A. actinomycetemcomitans showed susceptibility to amoxicillin, amoxicillin plus clavulanate, while 28% of the isolated strains were resistant to azithromycin and 61.7% towards metronidazole. No P. gingivalis resistance towards amoxicillin, amoxicillin plus clavulanate, metronidazole, and azithromycin was found. A. actinomycetemcomitans and P. gingivalis were frequently detected in Moroccan patients with periodontitis, while antimicrobial resistance was only detected for A. actinomycetemcomitans to metronidazole and azithromycin. A. actinomycetemcomitans resistance against some antimicrobials in periodontitis patients in Morocco can influence the selection of the therapeutic approaches. 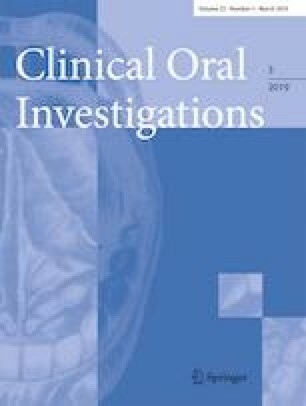 • In a group of Moroccan patients with chronic or aggressive periodontitis, the prevalence of Aggregatibacter actinomycetemcomitans and Porphyromonas gingivalis was 79.5 and 84.4%, respectively. • A. actinomycetemcomitans showed susceptibility for amoxicillin and amoxicillin plus clavulanate, while 28% of the isolated strains were resistant to azithromycin and 61.7% towards metronidazole. • No resistance towards amoxicillin, amoxicillin plus clavulanate, metronidazole, and azithromycin was found for P. gingivalis in this Moroccan periodontitis patient cohort. We thank Itziar González and Ana O’Connor from the Laboratory of Dental Research, University Complutense, Madrid, for their technical assistance. MM carried out acquisition of data, performed the antimicrobial susceptibility tests, and drafted the manuscript. LL and AL carried out the acquisition of data. PP and MCS processed the samples. DH conceived of the study, participated in the design of the study, and revised critically the manuscript. MS participated in the design of the study and its coordination. OKE took part in the coordination of the study, in the collection of the data, and revised critically the manuscript. All authors read and approved the final manuscript. The work was supported by the ETEP (Aetiology and Therapy of Periodontal Diseases) Research Group, University Complutense, Madrid, Spain.